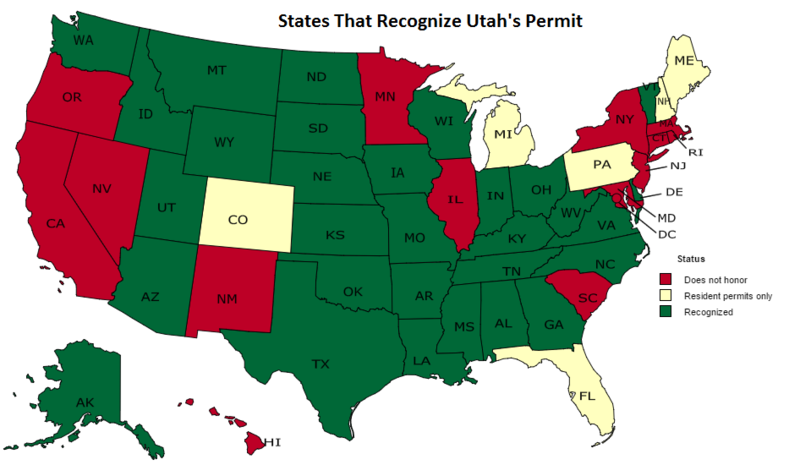 Utah does not have purchase permits, gun registration, or gun-owner licensing. There is no waiting period mandated for firearm purchases and private gun sales are legal. Concealed weapon permits (CCW) are-shall issue, all US permits are recognized, and open carry is allowed (with some exceptions). The secure areas of airports, non-public areas of government buildings (secure areas), courthouses, courtrooms, mental health facilities or correctional facilities are off-limits to firearms. Public area of other government buildings are legal. Secure storage must be provided. See also 76-8-311.1 and 76-8-311.3. No gun signs on private property do not ​have the force of law. Failure to comply with a request to leave or to disarm would be trespassing. Frontier Carry recommends taking your business elsewhere. Concealed firearm permittees, those with administrative permission, or a weapon in a vehicle, is legal (76-10-505.5). Child care facilities and pre-schools are also considered schools. Open carry is legal (see details). Provisional permittees 18-20 may not carry in a public or private elementary or secondary school or on the grounds (53-5-710). Open and concealed carry on campus with a permit is legal for students and staff (76-10-505.5). Staff does not have to inform their supervisors they are carrying. Provisional permittees may carry at colleges and universities. Churches (and houses of worship) may choose to prohibit firearms (76-10-530). The Church of Jesus Christ of Latter-day Saints prohibits firearms on all its property. BCI page here. It is legal to carry a loaded firearm, concealed or unconcealed, in your own home or on your own property without a permit. National Forest and Bureau of Land Management (BLM) lands in Utah have no ban on the carry of firearms. Firearm carry on Indian reservations is a gray area. Some reservations in Utah do permit concealed carry with a valid concealed firearm permit, however, it may vary. Tribes cannot enforce tribal law on non-tribal members, though they can enforce state and federal law. You may be trespassed from the reservation and have your firearm confiscated. One should contact individual reservation authorities for clarification of their regulations. ​Generally, state agencies and local governments are prohibited from making their own firearm laws and regulations. This is a concept known as state preemption and intended to promote uniform laws throughout the state. No municipality (counties, cities) or other government agencies can make or enforce firearm laws, rules, or regulations except as specifically authorized by law. The effect of this law makes local laws or rules that regulate anything other than discharge of firearms null and void. While some authorities may be in denial of the effect of Utah's uniform firearm law regulations, the law is on the side of the armed citizen. A minor under 18 years of age may not possess a dangerous weapon unless has the permission of his parent or guardian to have the weapon or is accompanied by a parent or guardian while he has the weapon in his possession. Any minor under 14 years of age in possession of a dangerous weapon shall be accompanied by a responsible adult (76-10-509). A minor under 18 years of age may not possess a handgun, a short barreled rifle or short barreled shotgun, or a machine gun (76-10-509.4). A parent or guardian who knows their minor child is illegally in possession of a firearm must make a reasonable effort to disarm the child (76-10-509.7). A minor who purchases a firearm must be in the presence of their parent or guardian (76-10-509.9). A minor also generally may not have a firearm at a school (76-10-505.5). 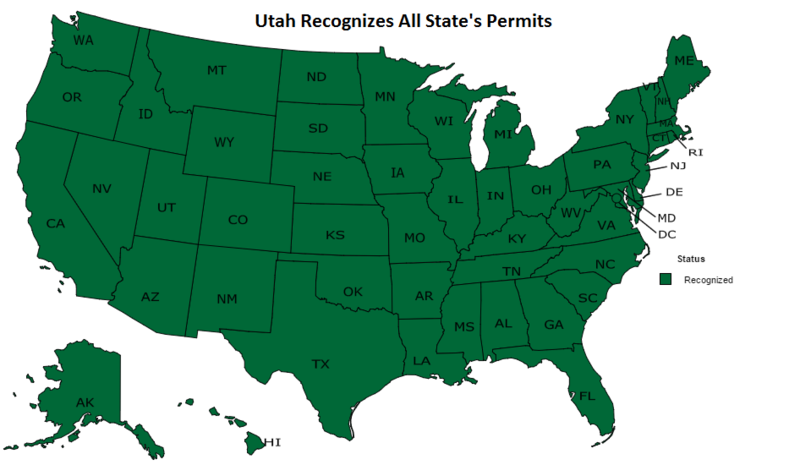 Utah recognizes all states'/territories' permits.